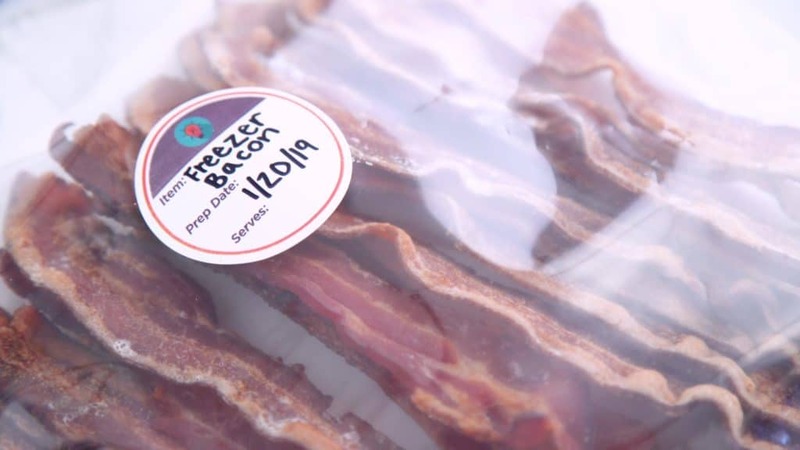 Batch-Baked Freezer Bacon: How to Cook Bacon in the Oven & then FREEZE It! If you’re on a keto diet and a meat-eating omnivore like myself, you are probably well-versed in cooking (& eating) bacon. 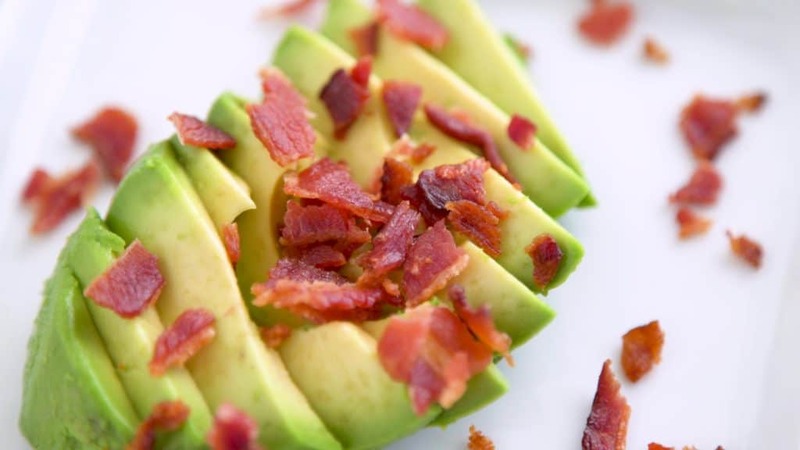 For me, bacon is a go-to breakfast staple when I’m eating low carb! But, even with all of that bacon expertise, my mind was BLOWN when I learned how to cook bacon in the oven instead of on the stove… And then freeze it?! No standing over the stovetop, no dodging the hot grease crackling on the pan, not even any flipping of the slices required. Plus, by cooking bacon in the oven, I can cook SO much more at the same time! Around 10-12 slices fit on one sheet pan, and I can cook multiple sheet pans in one oven. After about half an hour, I’ve got loads of perfectly crispy oven baked bacon ready to enjoy, and my kitchen smells like heaven! But, what happens if I can’t eat all of it at once, you ask? I also had the same fear—until I learned how to FREEZE cooked bacon to store for later! Seriously, this may seem silly…but batch cooking bacon in the oven has changed my whole keto meal prep breakfast game. And, being able to have cooked bacon on-hand in my freezer that I can reheat in the microwave is a lifesaver on busy days! Cooking bacon is fairly simple to begin with—but baking bacon is so unbelievably easy, I don’t know why I didn’t start doing it sooner! 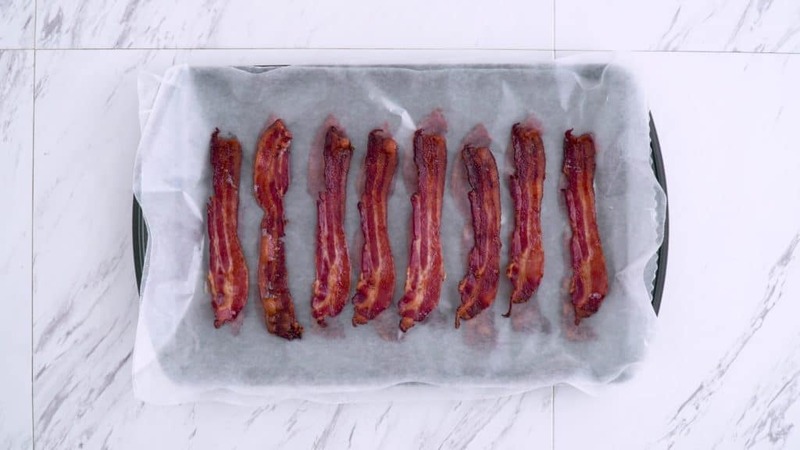 To start, you’ll need a sheet pan or two, depending on how much oven baked bacon you’d like to make and the size of your bacon slices. I recommend lining your pans with foil to catch the grease and for easier cleanup! Then, arrange your bacon slices side-by-side in a single layer on the pan. I can usually fit 10-12 slices on each pan, and I like to bake two pans at the same time for my keto meal prep purposes. No oil or other prep is necessary—you’re ready to bake! Once you’ve got your pan(s) prepared, pop ’em in the oven at 400°F (200°C) for 20-40 minutes. Exactly how long to bake bacon will vary a bit depending on the thickness of your slices and how your oven works. So, at least for the first time around, I recommend monitoring your bacon in the oven to find the right cook time. No need to flip during cooking—you’ll know it’s done when your bacon strips are as crispy as you like them! For mine, I’ve found that 30 minutes works pretty perfectly. 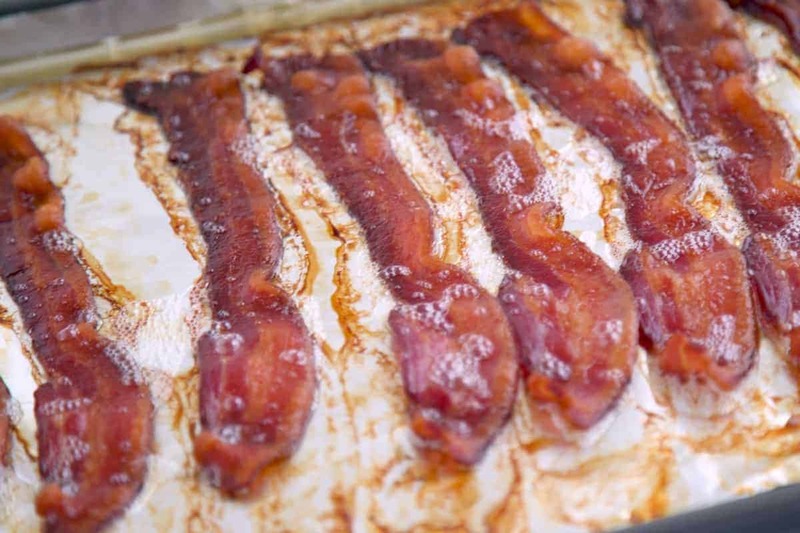 Remove your baked bacon from the oven and feel free to serve and enjoy immediately! Or, if you like the idea of having some bacon easily accessible, for quick breakfasts or keto snacking…try freezing cooked bacon! 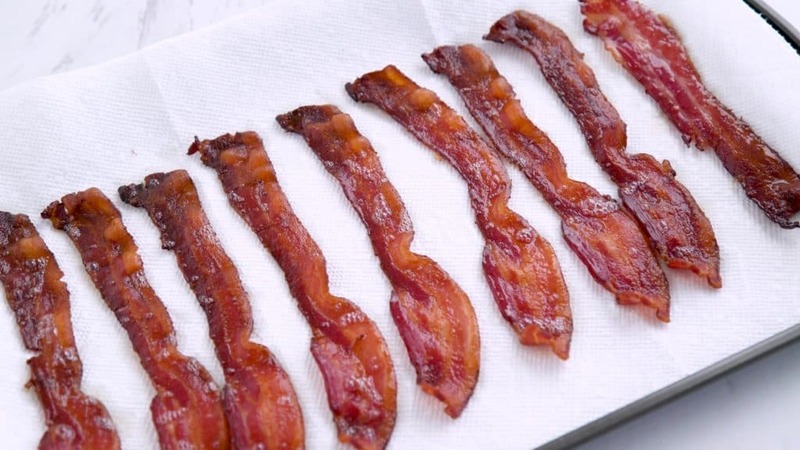 First, place your baked bacon strips onto paper towels to cool. 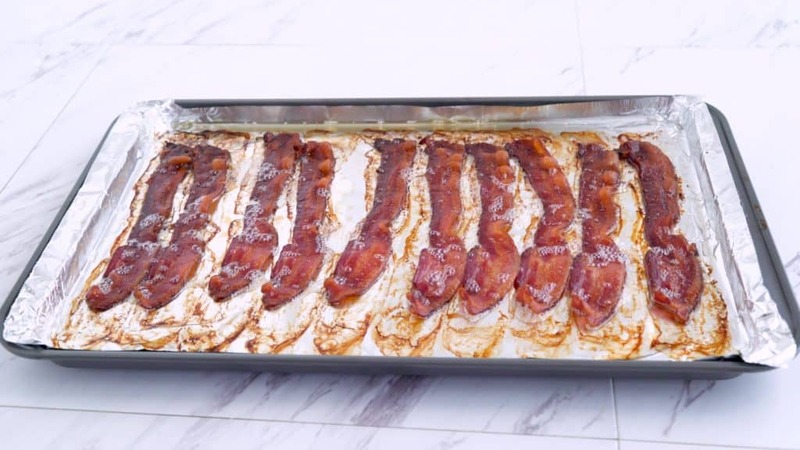 Then, line a sheet pan with wax paper and place bacon strips on it in a single layer. Cover with another sheet of wax paper (if needed), add another layer of bacon, and repeat until all of your bacon is on the pan. Use plastic wrap or foil to cover the entire pan and transfer to the freezer for 2-3 hours, or you can leave it overnight. Finally, you can transfer your bacon strips from the pan into a large freezer-safe bag to store. Carefully remove as much air from the bag as possible before sealing, and I recommend labeling the bag with the prep date. Toss that bag in the freezer and store for up to 4 months! When you’re ready to reheat your frozen cooked bacon, simply place as many strips as you want onto a microwave-safe place and microwave for about 30 seconds! If you prefer, you can transfer your bacon from the freezer to thaw in the fridge on the night before you want to eat it. But, it’ll work just as well to microwave it directly from the freezer! You can enjoy the strips whole as a side dish with your keto breakfast, or you can crumble them up and use as a tasty topping. Honestly, I was surprised by how perfectly crispy the frozen bacon tastes after reheating in the microwave. It really tastes AND smells like freshly oven baked bacon! And, on busy mornings when you’re in a time pinch, having that frozen cooked bacon ready helps to cut down on the time it takes to fry it up. 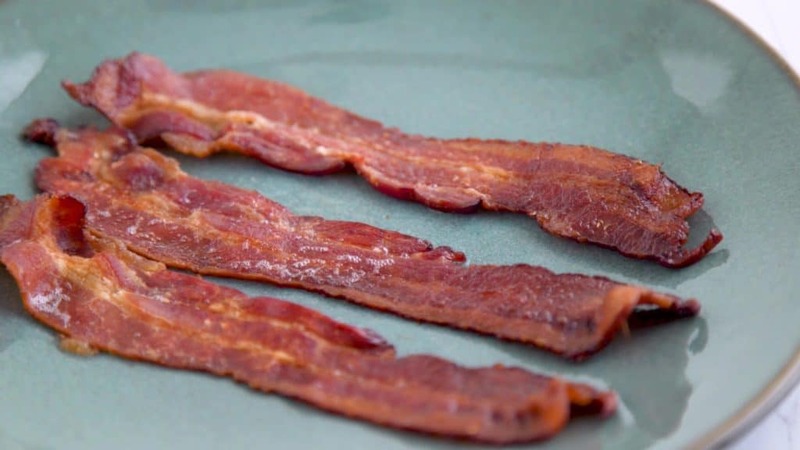 Even if you don’t need frozen cooked bacon on demand for your personal needs…knowing how to cook bacon in the oven can simplify your keto cooking. 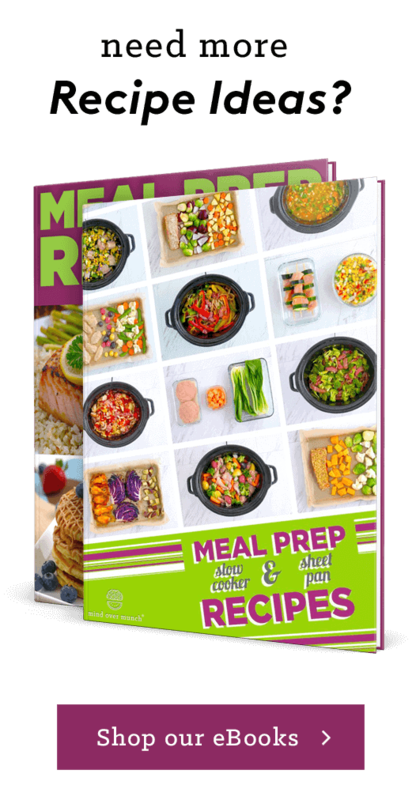 An awesome keto meal prep option for my fellow true bacon lovers! 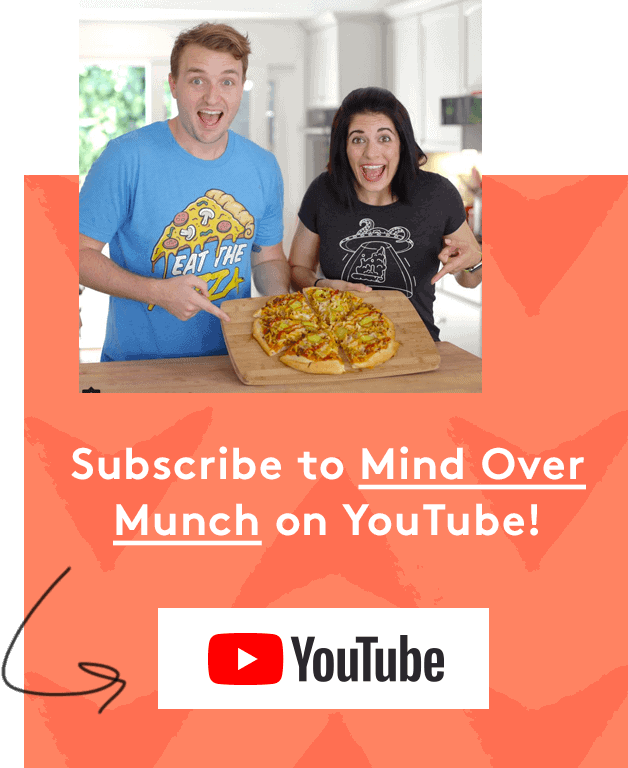 And, if you liked this recipe, you might also like my freezer-friendly keto pancakes, or my make ahead keto breakfast casserole! Line 2 sheet pans with foil for easy clean up. 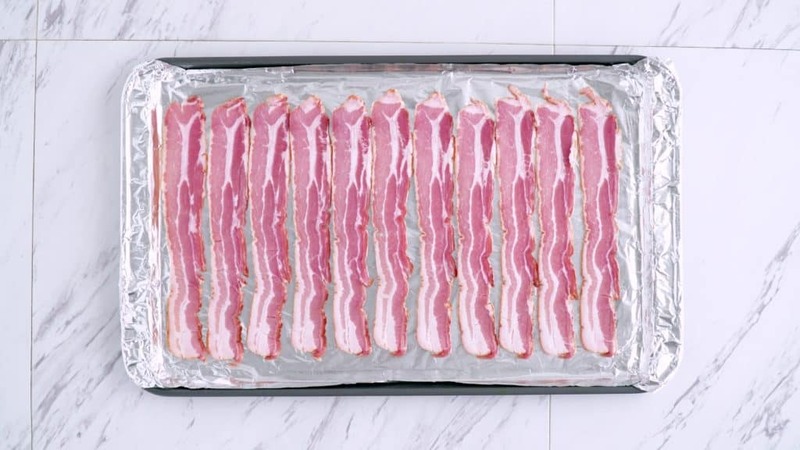 Arrange bacon slices on each tray in a single layer. Or, to store for later, transfer bacon strips to paper towels and allow to cool. Add a layer of cooked & cooled bacon strips, then another sheet of wax paper, more bacon, etc. until all cooked bacon has been used. Cover with plastic wrap or foil and freeze 2-3 hours, or overnight. 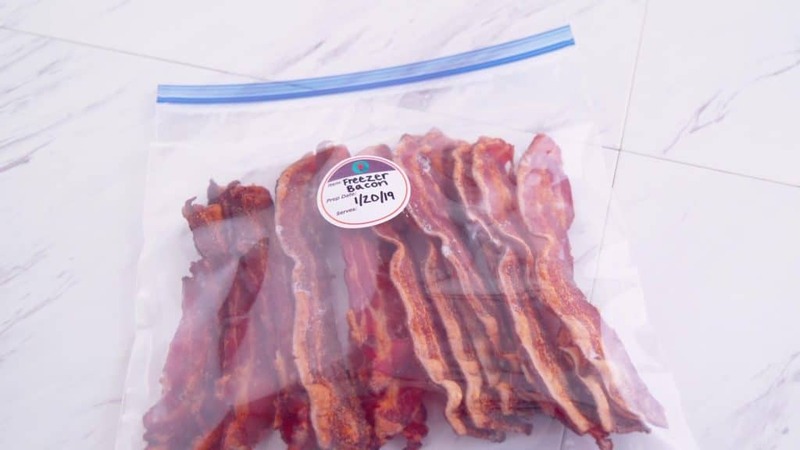 Transfer frozen bacon strips to gallon freezer bags, or package into smaller freezer bags for individual portions. Remove as much air as possible before sealing and label each bag with the prep date. Optional: Transfer frozen bacon to the fridge to thaw overnight before reheating. Or, microwave directly from the freezer! Add bacon strips to a microwave-safe plate and microwave for 30 seconds. Enjoy whole or crumble into a dish!